The crankshaft harmonic balancer is linked to the engine’s crankshaft. The crankshaft shakes violently when it receives energy from the bulging pistons. The harmonic balancer acts as a mediator between the pistons and the crankshaft by making sure the transfer of energy is less violent. At very high speeds, violent shaking can disrupt the engine’s mechanism and reduce its life. 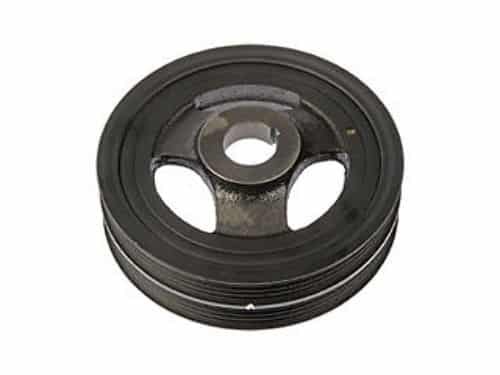 The harmonic balancer is made up of top quality rubber and metal. The combination ensures the energy is properly absorbed and the balancer stays young for a long time. As the crankshaft harmonizer fails, a number of troubling signs arise that are usually easy to spot. These potential issues can alert you, so you can schedule an appointment with the mechanic at the earliest and get the issue solved before it becomes more serious. When the crankshaft balancer loses its harmonic functions, the issue it is supposed to control comes out in full force. You will feel this with the violent shaking of your engine, especially at very high speeds. This is possible if the rubber in the crankshaft harmonizer wears out after constantly getting a lot of abuse. As the problem worsens, the engine shaking will become even more violent, causing the engine to explode eventually. The crankshaft harmonic balancer is usually found in the front of the crankshaft pulley and is attached to the crankshaft. If the crankshaft wears out unequally, or the layers of rubber and metal slip or dampen, the timing marks will be throw off balance. This effect will make timing the engine a really impossible task for you or your mechanic while using a timing light. The destruction of the various layers of rubber and metal can ultimately cause the crankshaft harmonic balance to slip from its position. This is very dangerous and if it happens, firstly your engine timing will be affected which will immediately cause the timing belt and other related belts to come off. Ultimately, your car will stop moving and a number of other mechanical problems will arise. Therefore, it is advisable to always take your car to the mechanic every few months for a general inspection. This practice should be regularly followed if your car is more than 10 years old. When the issue is in its early stages, there are more chances that your mechanic lets you off after a few repairs. However, if you are lazy with repairs and general maintenance, be ready to present some serious money for replacements. A worn-out crankshaft harmonic balancer will also cause a lot of noise in your engine. You will feel this noise once you start to accelerate your car to higher speeds. If this noise is too loud, it is better to not drive the car and call a mechanic. However, loud noise can be caused by a lot of other failing components, so take the advice and services of a mechanic before your car problems worsen. The crankshaft and its harmonic balancer are under the protection of the engine block and its many nuts and bolts. In order to reach them, you need to open up the engine almost halfway, before you or your mechanic can even attempt a repair. This commitment can become easier if you are absolutely sure the crankshaft harmonic balancer is at fault and not some other engine component. When the crankshaft harmonic balancer fails, the direct effects are felt by the rubber ring between the inner hub and the outer ring. The condition of this ring can deteriorate due to a number of factors such as heat, cold, dirt and debris among which is also the timing of the harmonic balancer. You will also see cracks on the balancer hub or the outer ring if the pressure from the harmonic balancer is too much. The crankshaft harmonic balancer is connected to a timing belt. So, to check the harmonic balancer’s failure you need to first take a look at the various belts of your engine. These belts will either have oil leakage in them, which will cause them to slip and make annoying squealing noises or they will be damaged. The crankshaft harmonic balancer will disrupt the engine’s ‘heartbeats’. To notice a change in the idling noise you have to listen very closely. This exercise is a bit easier if you have a car with a electronic ignition. The harmonic balancer is a component that is completely crafted from scratch. You have no control over its wear and tear or over its repairs. Especially, because the rubber used in its construction is of extremely good quality and it cannot be repaired or replaced individually. Your only option is to think about going for a replacement, as that is the only way you will get a full-fledged new harmonic balancer. The harmonic balancer is usually not very expensive, but given its importance, it can be pretty exorbitantly priced in some regions. Since this component is solely crafted, it is not like you can replace half of it now and the other half later. You have to make the complete replacement at one time, no matter the cost. Normally, a crankshaft harmonic balancer costs $100 – $400. The more exotic or rare your vehicle is, the more you are expected to pay in the higher range. Furthermore, the cost depends on the brand of vehicle you drive. The harmonic balancer for a Mercedes or BMW will naturally cost a lot of bucks, whereas a locally assembled vehicle’s parts will not cost you much. Moreover, the cost of the part is compounded by the labor cost you need to pay. The crankshaft harmonic balancer replacement will require you to pay $100 – $250 in labor costs, obviously depending on the work.